I can’t begin to express the excitement that is beginning to stir up right here at the Y.O.! In addition to all of that fun of freebies, we are still continuously introducing new foods and specials to our menu as well. Have you tried our BBQ Brisket Quesadillas? They are a great spring & summertime meal, cooked with the best beef brisket you can buy. Try it out yourself and let me know what your thoughts on it are! We aim to please all those hungry and thirsty taste buds out there. So with all of this goodness floating around what are you waiting for? Come out and join us, with or without your pooch, and see why the Y.O. Steakhouse is the best at what we do! 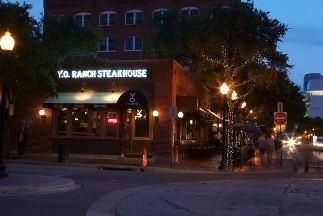 Serving up Texas Elegance in a warm, relaxing atmosphere…..that’s the Y.O. Steakhouse in the beautiful Dallas West End! We’d love to have Ya!